Tom Lathrop had the most liked content! Velocity and speed are not the same things. Velocity has a direction component and speed does not. Lots of engineering students have gone off track by confusing the two terms. 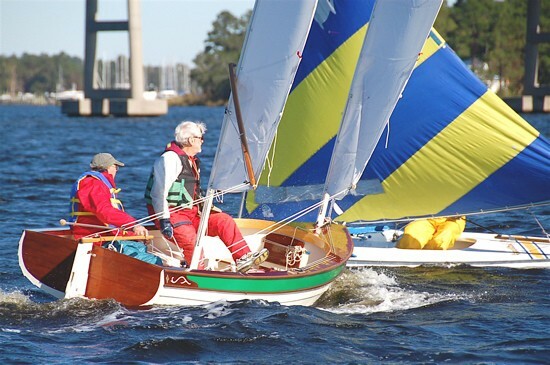 Therefore VMG means speed made good in a specific direction, which can be upwind, downwind or crosswise. Neither SMG nor CMG are as well defined although CMG can be so defined if you wish. Alan, What are your thoughts of the new roller spinnaker relative to the old one? Our Spindrift 10 was named Scoter. Bay River Skiff was Loon, Liz named all the Birder kayaks. She also named the Lapwing. 8 foot tender was Chirp. Grand Slam 7.9 was Merlin. Hunter 22 is Rooster. Windmill 15.5 was Harbinger. There are some outliers like a 13' runabout Scamp and BJ24 LIZ was named for her. There are more birds than boats so there will be no shortage of bird names for anyone. Mike and Linda's Red Knot continues the tradition. We were out but not in a sailboat and had Bluejacket 24 LIZ out. I have either sold or given to others almost all my boats. There comes a time for that and doctors say that my time has arrived to take things easier. Here is a photo of Avocet. Avid birdwatcher Liz was impressed as the avocet is her favorite bird. Sorry for the quality as she had the camera on the wrong input and Photoshop plus my skill level can only do so much. Wonder where the other 43 boats were in this picture? Good to see Core Sound MK3 Avocet out with the other 44 boats on the Neuse yesterday. Looking as sailing great while doing well against all the big boats. You're right Chick, but then it never gets the chance as it gets swallowed first. Oyster brings up another apparently lost art which is, how to cut up a chicken for frying. Every year for Thanksgiving Liz and I get together in Cherry Grove Beach, SC with her relatives for several days of eating and jawboning, but mainly eating. Sometimes my contribution is a smoked turkey but mainly I cook three fryers. Now a Fryer is not just any chicken but the proper southern name for a chicken young enough to have the best and tastiest small parts, not the big and chunky, not to mention older and tougher birds. I do cheat a bit and cook in a Frydaddy and Grandpappy outside as the kitchen stove is always crowded with other cooks inside. I do most of the cooking that includes oil or grease outside, which gains points with the important people of the household. Chickens, shrimp, arsters, soft shelled crab, okra, corn dogs as well as other bits find their way into the deep fryer. Fish are best done in a cast iron washpot over an open fire but that is another story. We used to get our chickens from the Village Butcher in New Bern until they changed hands and the new butcher had no clue on how a chicken should be cut up or what the pieces should look like. How someone got to be a butcher without this necessary skill, I have no idea but some chicken lovers just turned up their noses at the unrecognizable pieces on the plate and moved on to other fare. Among the 40 or so hungry eaters are always plenty of experts of southern culinary fare who look with disfavor on anything that looks as if it may have come from KFC. Not my fault but I was embarrassed just the same. Several Thanksgivings ago, the Yankee spouse of one local actually brought a tub of KFC to the feast and was forced to take a re-education program before being allowed back to the table. Now we, mainly Liz, cut up our own chickens and everyone is happy once more. Occasionally one family will bring a boiled county ham to the feast. Now, it's probable that most of you have never heard of or even considered that a salt cured country ham could be made edible by boiling it but, behind such assumptions linger the greater truths. As a lover of salt cured ham, I myself had some trouble getting past the apparent sacrilege of boiling such an already tasty cultural icon. Nevertheless, an epicurean delight awaits the adventurous eater who is lucky enough to be offered such a treat. When I was running the early tests of the BJ24, I bolted on a Duel Fin and ran through the usual tests. The difference was a reduction in speed at all RPM levels. This indicated an increase in drag with no benefit observed. I could not detect any significant change in the trim of the boat with the fin. The natural trim of the Bluejacket appeared to generate a lot of longitudinal stability in trim and overpower any effect added by the fin. Perhaps if there was a greater angle of the transom a fin would have more effect in lifting the stern and/or depressing the bow but on LIZ, this was not the case. There is a lot to say about hull trim and the effect of balance and hull bottom design on it. I second Graham's thought to add a more forward steering station on Old Codger for both better control of hull trim as well as making long passages less tiring. Maybe Chick's tolerance for holding that tiller forever is greater than mine. I get cramps thinking about it. We are still slowly working our way through the mess left by Florence and our not-perfect preparations. There is one important issue I want to bring to anyone who faces floodwater. A friend here in Oriental was infected by a virus found in the mix of river flooding and brackish water that is deadly. My friend contacted it in shallow water in his garage before it was completely drained out. It started to bother him soon after the exposure and he went to the doctor. The doctor said he had to get to hospital quickly and he wanted to go to Duke Medical but the doctor said he would not live to make the trip to Durham. Wow. They had to amputate his leg and some other bits immediately or he would not survive. Liz and I visited him yesterday and it looks like he will make it out of the IC with one leg. The virus can apparently penetrate skin without the need for a cut or other raw entry. Another man in Wilmington was less fortunate and died as a result of the same or similar virus/bacteria from Florence waters. https://www.coastalreview.org/2018/09/public-health-safety-key-issues-post-florence/ Not to broadcast scare tactics but this is serious stuff that most of us have never heard of. I've worn boots when in hurricane water and and only once in deep water without protections to encourage hurricane Irene to leave my shop by prying a door open. Never again though. Two people out of about a total of 13 or 14 deaths in NC due to Florence is way too high statistically to ignore. This is a sketch of what the hull extension/bracket would look like. Details would vary depending on the application. Bluejacket plans already include a plan for an integrated bracket/swim platform. None has been built yet, so far as I know. My preferred version is not a bracket, as such, but a hull extension almost identical to Sam's Red Salmon although 600 Verado horses charging along behind is kind of scary. I think this may what you are looking for anyway.